When this project of passion began nearly seven years ago, I could not have imagined the lengths at which this endeavor would reach. 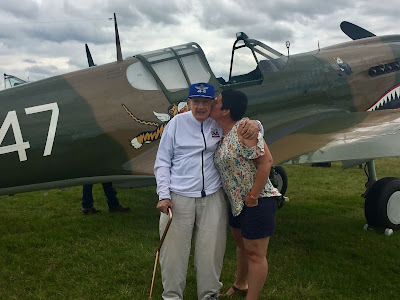 Although there have been numerous highlights, and I mean numerous- many of which have yet to make an appearance on this site, my friendship with WWII Aleutian Island P-40 pilot Lt. Col (RET) Bob Brocklehurst has to be at the top. I am not sure what the odds are of meeting the last living Aleutian Island P-40 pilot just fifteen minutes from where I live by way of a client who, at the age of 85, is still cutting hair at the old timers barber shop five minutes from where I work and who just so happen to cut Bob's hair one day, but they have to be in the range of 'winning the lotto' proportions. This jackpot reunion between Bob and I would lead to a non stop host of adventures that neither one of us could have foreseen. Funny how life does that. There are no accidents, even at the age of 96. Truth be told, I am not sure who was more excited- Bob or myself. He thought he was going to bore me with his war time stories. Little did he know what he was getting himself into. I showed up at his house with all my grandfather's memorabilia in tow and ready to record every word that came out of his mouth. From that point on the journey began and we never looked back. Bob's contribution to the the Aleutian Campaign research effort was immense. Through Bob I was able to get a better understanding of what my grandfather and his comrades were up against when flying in the Aleutians, what life was like being stationed in such a remote place and the challenges they faced day to day. He became the voice and face of those airmen who are no longer with us. And because of Bob's stories, I was able to connect faces and names to the literature I was researching creating an even stronger personal element to my work. Here are just a few examples of the extraordinary connections that we discovered along the way. 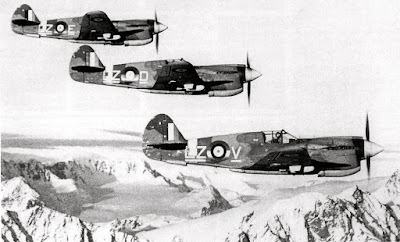 In April 1943 while stationed at Fort Glenn on Umnak, an RCAF Kittyhawk flown by P/O Thomlinson with No. 14 Squadron crashed killing the young pilot. 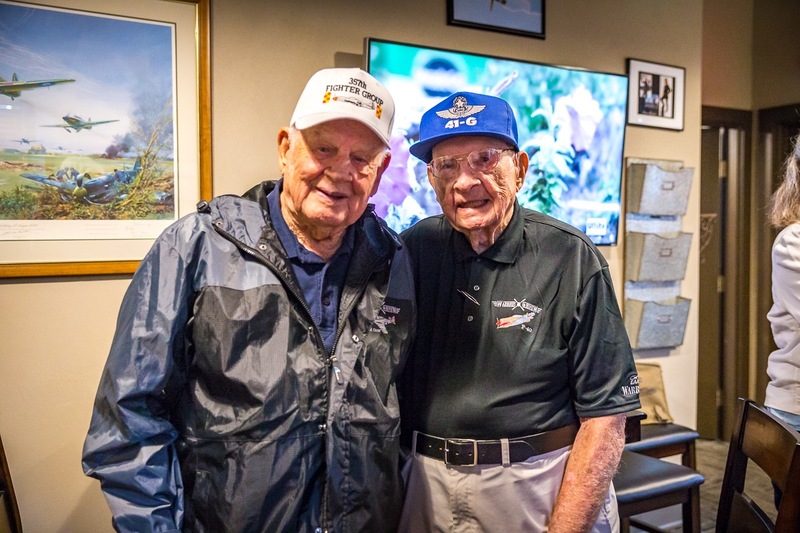 Bob, also stationed at Fort Glenn at that time with AAF's 344th squadron, was the one who walked up the airstrip and found the Canadian airman. 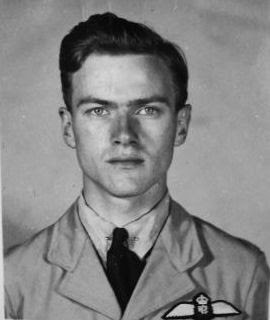 RCAF airman P/O Thomlinson. He is buried at Fort Richardson National Cemetery in Anchorage. Bob also tells a story about his 41-G classmates, F/L Bacon, F/L Dunn and F/L Crisp and how they became the brunt of the joke at roll call (Bacon Dunn Crisp... ). 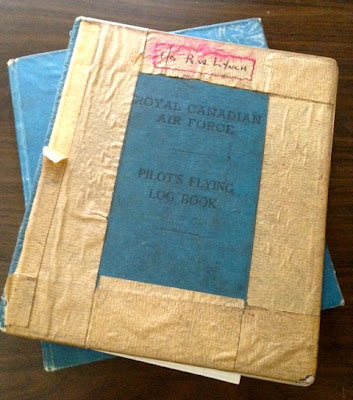 This was one of the first stories he told me actually and it was just recently while researching the RCAF squadron diaries during the time they were stationed at Fort Glenn and flying joint patrols with the 11th Pursuit Squadron, that I, low and behold, discovered the names of both Lt. Bacon and Crisp as part of the days personnel on patrol with the Canadians- and with my grandfather I might add, who was also part of the days rotation! We flew six patrols this morning. Lt. Bacon who substituted for P/O Gooding, flew with S/L Boomer. At noon W/C McGregor, P/O Orr, P/O English arrived from Elmendorf Field after spending the night at Cold Bay. bringing three P-40 K1's with them. Incidentally, a fair quantity of mail also arrived. They also brought with them socks for the officers and men, games and playing cards. These were donated by the American Red Cross and were greatly appreciated. This is the first time in the history of a squadron that a donation of any kind has been received. We take off our hats to the good ladies of the American Red Cross. In the evening, Major Ashkins' volleyball team defeated our sextet two games to three before a huge crowd of spectators. Flying time today totaled 13:05 hours. But best of all, is an entertaining recollection from his early days when he was with the 11th Pursuit Squadron in Oregon just before heading to Alaska. It was early 1942 and the day's flight path was Portland to Medford, Oregon. Bob somehow got lost and ended up landing his P-40 on a cub sized field in Grant's Pass, Oregon instead. By the time he got to the hanger area, what looked like, the entire town was gathered around to welcome him. 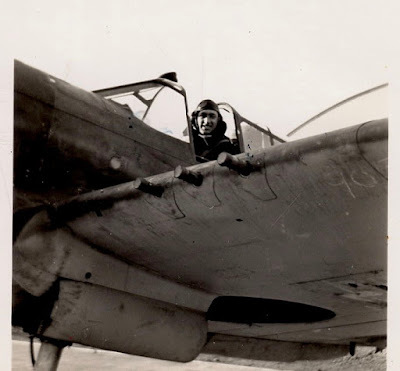 He telephoned his supervisor, Major Al Aiken, who drove over the next day to fly the P-40 out of there while Bob, much to his dismay, was sent to the back seat of the staff car. Fast forward five months to the Aleutians- it is September 25th, 1942, the Americans and Canadians take off from Adak on their first joint offensive over Kiska Island and actually, the first P-40 escorted bomber mission of the campaign. My grandfather is one of the Canadians flying that day. As they approach, four zero's come up to meet them and one is hot on the tail of an American P-40 over Kiska Harbor. 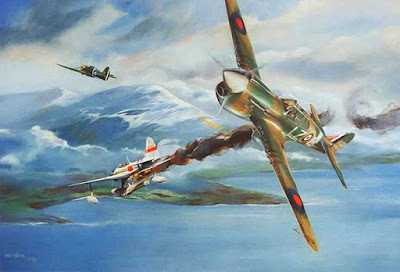 RCAF Squadron Leader, Kenneth Boomer sees it, flies up underneath him and let's him have it. The Japanese plane goes down and the American plane makes it home. The pilot of that American ship.... was none other than Major Al Aiken. THESE are the things I will miss about Bob. The stories. The ability to call him up on a dime and ask him things or to share with him the latest discovery. Research is research but it means so much more when you can connect it personally. Most importantly though, above all of Bob's irreplaceable contributions to the Aleutian Campaign recognition efforts, I will miss Bob's friendship the most. Bob was a inspiration. He epitomized what it means to live. To wake up every day with a plan and to pursue it with zest and with joy. To speak honestly and frankly. To be impeccable with your word. To say what you feel. Bob had a way to energize you. He inspired you to be at your best. His ability to remember names and details of things put me to shame. I can barely even remember why I went in the darn kitchen! His charisma and openness to all humans was magnetic. One of my favorite moments of Oshkosh. 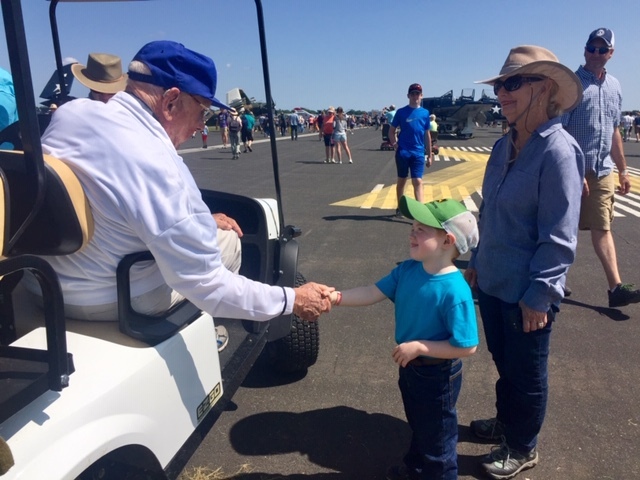 Engaging the younger generations so the lessons and sacrifices from his era are not lost. Another one of Bob's fans last year at the Venice Airport. My daughter Aly. What a gift he was to her as well. Bob also reminded me what a true gentleman looks like and the value in allowing a man to be just that; a gentleman. You see, I grew up surrounded by elders so having respect for them is something that is important to me. I remember vividly when Bob and I first met, I would naturally attempt to hold the door open for him until one day he firmly exclaimed "Karen will you let me be a gentleman!" I never held the door open for him again and I will always remember to allow the wonderfulness of gentlemanly behavior. Bob was a letter writer. 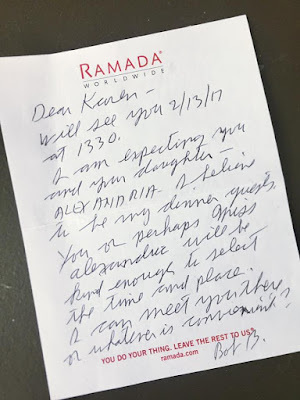 This was the first of many notes I received in the mail form him. The last time I saw Bob he was boarding a private jet as it's only passenger. He was headed home after a fun and successful 2018 AirVenture in Oshkosh, Wisconsin. 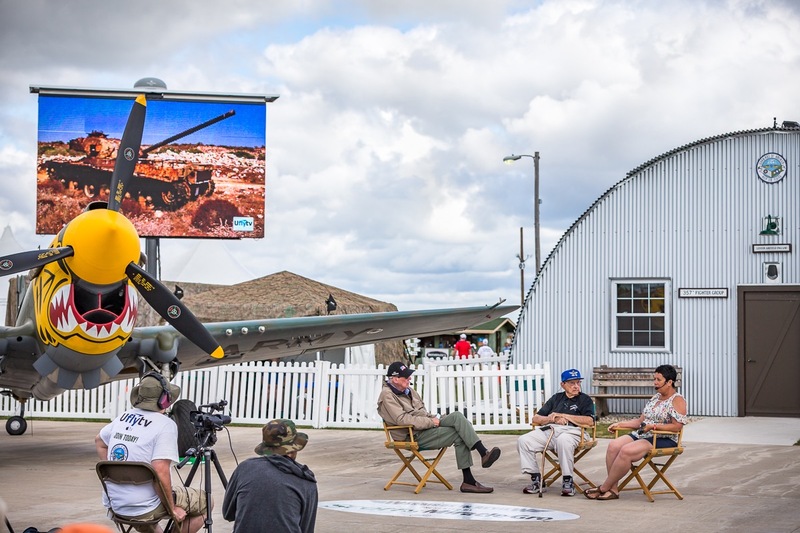 Bob and I were part of an Aleutian Island Campaign P-40 Warbird in Review session where we got to represent those who flew in the most treacherous place on earth. What an honor for me on so many levels to share the stage with Bob and to have his blessing over the work I do. Warbird in Review- Aleutian Campaign P-40 Session. July 2018. Watch it online here. 100 signatures later and still smiling. National Park Service & the RCAF provided the books we were signing. We spent the rest of the time tooling around in a golf cart courtesy of his good buddy Brian Norris and his amazing friends who took unbelievable care of us. Bob had always wanted to go the world's largest air show and after 98 years- he finally made it!! It just goes to show you that you are never too old for another first. In fact, Bob had such a good time, he was going to return this year as a volunteer!! I may have to go in his place. Bob & Brian Norris. 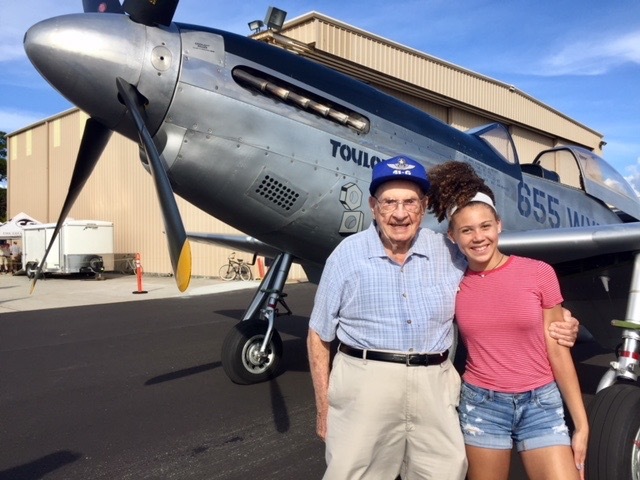 Brian is the lucky pilot that gave Bob his P-51ride a few years back. Check out that flight here and here. They have been good friends ever since. 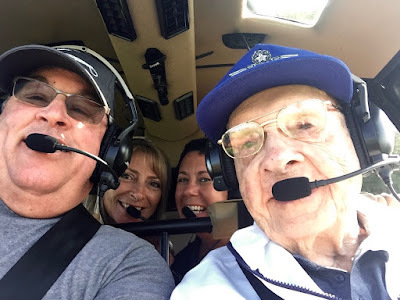 Another co-pilot opportunity for Bob- a helicopter ride over Oshkosh. Two WWII legends: Bud Anderson & Bob Brocklehurst in the green room. Modern day aviation legend Michael Goulian and his team were the ultimate hosts, opening their tents to us throughout the week. Myself, David Frasca & Bob in front of my Papa's plane, AK905. The Frasca family now own the RCAF Kittyhawk (painted as a Fighting Tiger). David flew it to Oshkosh to be part of our P-40 Warbirds in Review session. In fact- David was the one who first suggested we do WIR! So glad he did! Bob bidding farewell to my best friend Candice. I am so thrilled she got to meet him. She flew up from Winnipeg to join the fun and good thing- she is a professional photographer and one of her aviation photos from that weekend helped her win Photographer of the Year in Manitoba! 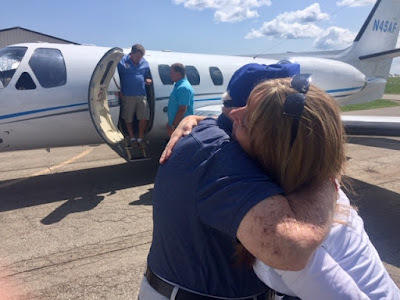 This blog journey has been chalked full of incredible synchronicities exactly like the ones that brought Bob and I together and I am certain they will continue to happen. As I have said all along, I am only the puppet following along the path being laid out by my grandfather, who coincidentally is also named Bob (Robert). Now, not only do I have my grandfather leading the way- Bob is up there as well. One Canadian, one American- a reminiscent joint effort. How fitting. Looks like I better buckle up! Robert L. Brocklehurst, you are truly one of a kind and I will miss you tremendously here on earth. I know you are still with me though and my work will continue in your honor and in honor of those who served with you. Enjoy your eternal wings and the freedom you now have to do all the loops and rolls you want. No restrictions- let 'er rip and give my Papa a hug for me. That discovery came just days after returning from Washington to see the first one. Some random email from someone I didn't know appeared in my inbox letting me know of a P-40E (AK-905) that was still around. This one though, was still air worthy!! Ohhh baby, the level of excitement at that moment could not have been measured. After doing some research to confirm the accuracy, I immediately emailed the owner, introduced myself and attached a photo of my grandfather sitting in the plane in 1941. AK905 then, with P/O Lynch seated inside, and the now. David Frasca gifted me this photo which now hangs in my dining room. AK905 LZ-D, flying over the Alaskan range, 1942. They were equally thrilled to hear from me because just as it is rare to find a family member's plane from the war, it is equally as rare for warbird owners to find their plane's original wartime pilots. To put it in perspective, the Smithsonian's Air and Space Aeronautics Department chair told me he can count on two hands the number of times they have been able to make a personal connection to one of their aircraft. 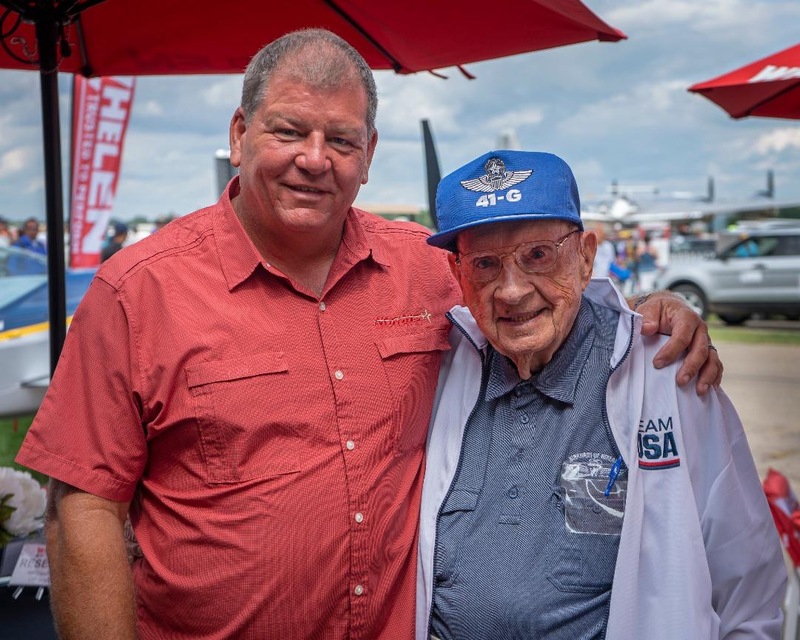 And he's been there 30 plus years with thousands of aircraft in their collection. Actually, the Smithsonian Air and Space collection ranks as the largest collection of aircraft on display in the world! So yeah, rare. Part of the challenge of reuniting pilots with planes is that so many of the planes were lost during the war and if the machines were lucky enough to make it through, the aircraft were hastily sold or scrapped shortly afterwards. A horrifying thought for restorers or aficionados now a days. Couple that with the fact that many airmen do not have their logbooks anymore so determining which aircraft they flew becomes even more difficult. 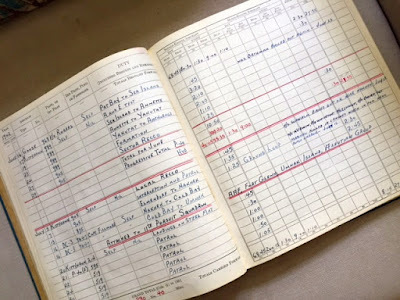 Fortunately for me, my grandfather was a meticulous record keeper and kept both of his flight log books; a good copy with photos and notes and the one he went to war with. This book has become my war bible of sorts, I reference it constantly. And because of that book we have miraculously been able to find THREE of the aircraft him and his squadron flew during the war! Truly astounding. P/O Lynch's log book AK905 entry. You can see he flew AK905 in Anchorage for several days right before flying, and crashing the Smithsonian's AK875. 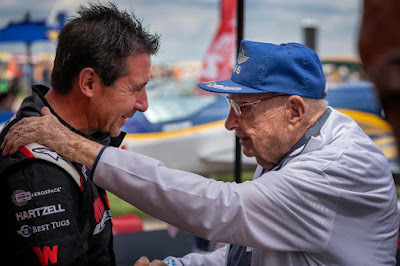 The current owner of AK905, as I call it, is the none other than the aviation pioneer Rudy Frasca (Frasca International- Flight Simulators) and I could not think of a better family to have it! It is immaculate (although painted, again.. like a Fighting Tiger). 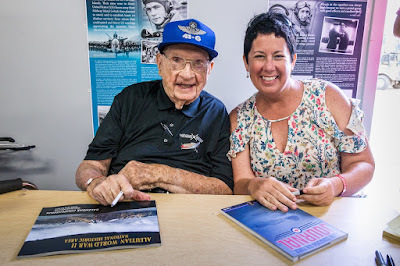 Rudy is an aviation legend and his name sits on the Smithsonian's Air and Space Hall of Fame wall recognizing his enormous contribution to the development of aviation over the last 60 years. 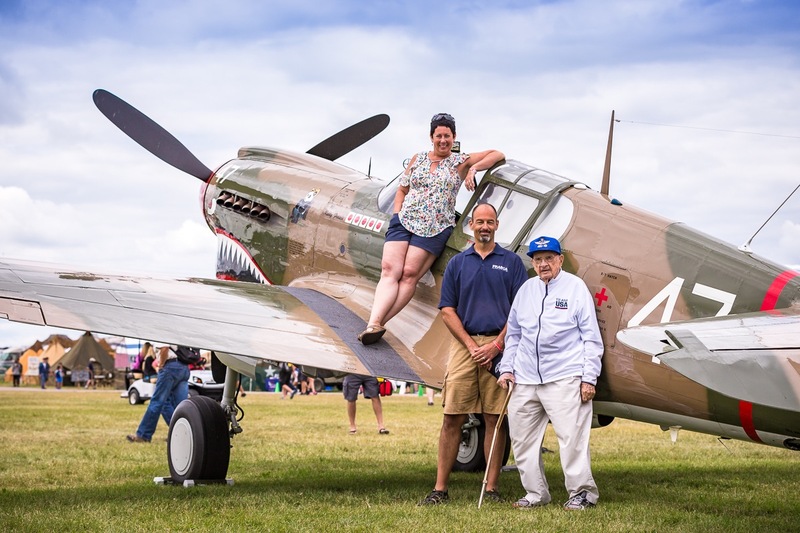 He purchased the Kittyhawk near his hometown in Illinois in 1976 and it has been his pride and joy ever since bringing it regularly to Air Venture air show in Oshkosh, Wisconsin. 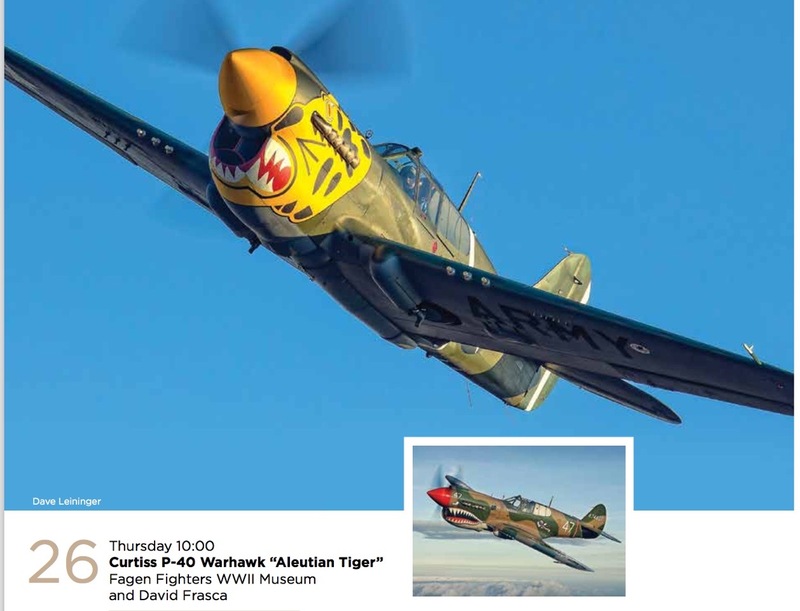 Rudy has been an active member of EAA's Warbirds of America since it's inception and at the suggestion of his son David, who now flies the plane, we were invited to participate in this year's Warbirds In Review session dedicated to the P-40 and it's contribution during the Aleutian Campaign. You can watch that session by clicking the link below the second photo. What an honor to be part of and to represent those who flew in the most treacherous and unpredictable of airspace around- the Aleutian Islands. After it's service with the Royal Canadian Air Force in Alaska (1941-1946) AK905 was struck off strength and by 1948 was for sale by Walter Motor Harris Dealership near Champion, Alberta. It was one of fifteen Kittyhawks available. 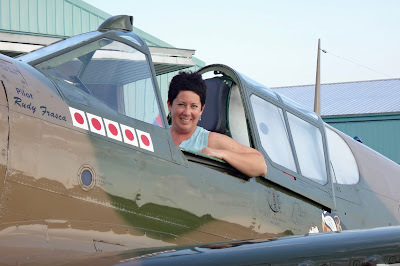 A lucky Albertan named Bob Wardon scrounged up the $150 they were asking for it and using an old military jeep, towed the Kittyhawk back to their farm where they slowly starting working on it finally getting it back up in the air in 1962. 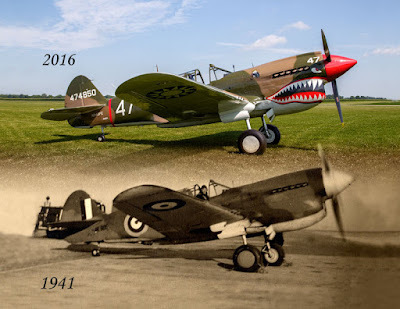 In the early 1960's, the P-40 flew in airshows around the area even making an appearance at the Abbotsford Airshow, the largest air show in Canada. In 1968, the Wardon's sold the Kittyhawk to Bill Ross from Chicago who owned it from 1968-72. It then sold again to Don Plumb from Ontario who did a lot of restoration work on it from 1972-1976 only to sell it to a fella from Colorado named Max Hoffman who turned around and sold it finally to Rudy Frasca where it still lives today. 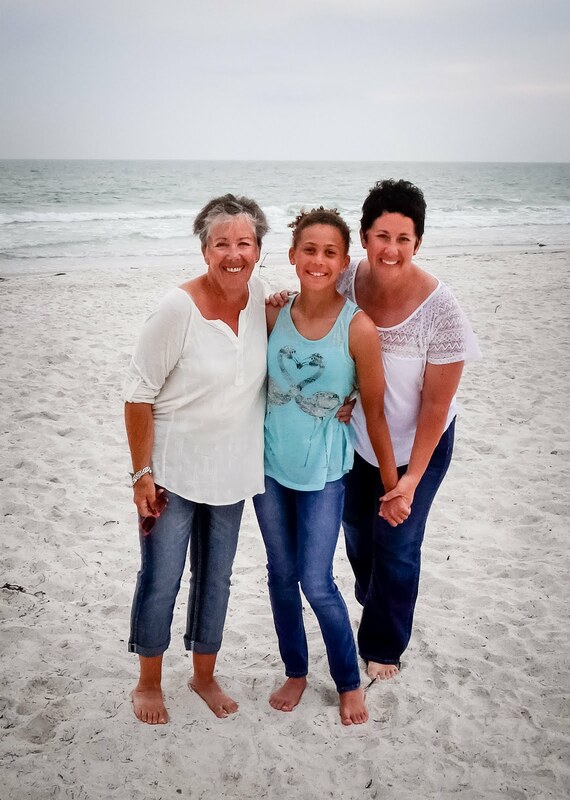 What a gift my family has been blessed with. I still have to pinch myself. It is one thing to have it hanging on static display in one of the best aviation museums in the world. But it is a whole other experience to be able to hear the roar of the engines, smell the burning of the fuel, see it speed past you and ultimately touch the controls of the very same aircraft your loved one went to war in. Quite surreal. I have to give enormous props to the Frasca family. They have been such a blessing welcoming me anytime to come and visit the plane. I get to sit in it like it is my own and most of all- I get to share it's story of how it once served to defend this continent. 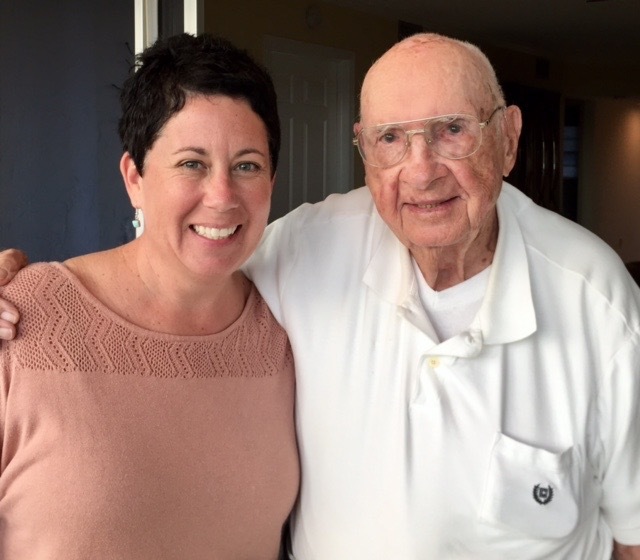 In keeping with my mission, this blog is not just about my grandfather, it is also about those he served with. To this date, here is a list of some of the other Royal Canadian Air Force 111(F) Squadron pilots who also flew AK905 in Alaska during the war. This plane lives on in their honor as well.